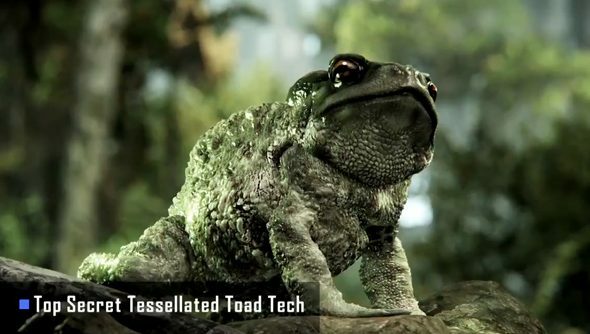 Much maligned by the specist propaganda put out by the writers of fairy tales, toads are finally receiving a positive public image from an unexpected quarter: the CryEngine 3. What stands out in particular is the focus on large scale vistas. It’s of course something Crytek have always been good at – Far Cry and the first Crysis in particular made impact with the sheer zise of the maps on offer – but in this tech demo the grand size is evident in almost every shot, on top of the complex particle effects and dynamic lighting. It’s a clever route to go, they’re setting themselves up as a response to the dank, brown corridor shooters of the past generation. Crysis 3’s February release date can’t come soon enough.